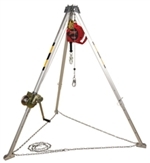 Confined Space System with Galvanized Self Retracting Lifeline - 8 ft. PRO Confined Space System with Galvanized Self Retracting Lifeline - 8 ft.
Standards ANSI Z117.1-1995, OSHA 1910.66, OSHA 1910.146, OSHA 1926.502, Capital Safety Gen. Mfg. Req. Self Retracting Lifeline with Stainless Steel Wire Rope - 66 ft Self Retracting Lifeline with Steel Swiveling Snap Hook - Web - 20 ft. (6.1m) Self Retracting Lifeline with Stainless Steel Wire Rope - Retrieval with Bracket Confined Space Winch - 50 ft.